There is no solace for the introvert. Always a constant clamoring outside in the streets, even the safe confines of our bedroom, our one place of true comfort, the chaos is still ever present. The days start early, invaded by honking, barking, yelling, and speeding vehicles. The jarring ring of our doorbell goes off, it’s the house cleaner, and though our dishes are cleaned and floor swept, I can’t help but feel a friction inside of me with this invader. India has crept in. I make my way downstairs to my ride to work. Two little girls, the apartment’s caretakers’ daughters, meet me; they’re dirty and naked but have smiles across their faces. They ask where Auntie is, most likely for some little candy treats. I wish so badly to speak to them, with their parents, but they all speak Bengali and I am learning Hindi. Oh how I wish I pushed to learn Bengali. I hop on my bike and feel a tugging sensation, I look back and the two little girls stare up at me, smiling, giggling. They start speaking to me but I can only guess at what they are saying. I continue on after shooing the girls off to their mommy. 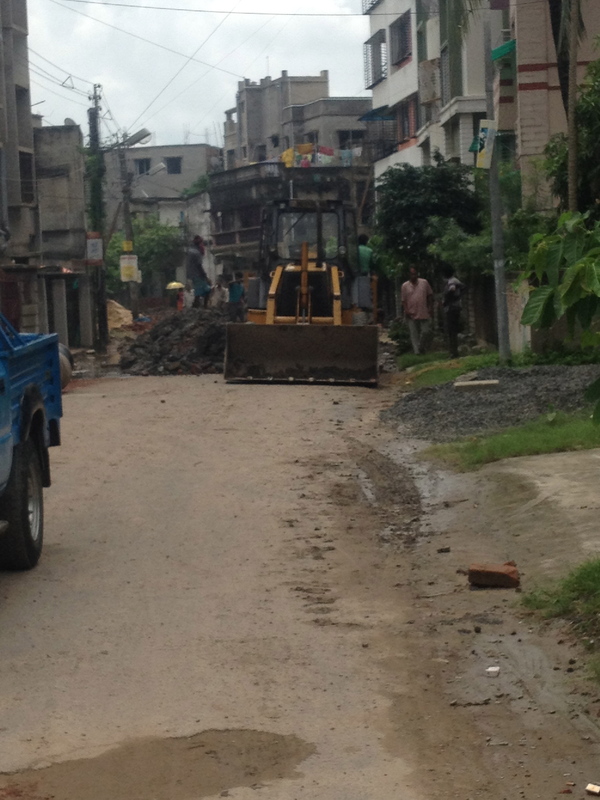 The roads are becoming more and more torn up by the construction, heavy trucks and rainy weather. I guess it’s no worse than the 100 plus degree heat wave that has been beating down on us the last several months. I pass the workers digging up the roads, piling up sand and stacking bricks. They have such worn faces, hands, feet. Are they here by choice or forced to work? I can’t shake the thought. Kids, women, they must be forced for one reason or another. There always seems to be too many of them working. Off shooting the “main” road are alleyways leading to shacks and shanties; homes, houses. Looking down one, a small boy, he stands naked, well, besides a red band of thread around his waist. It’s a Hindu thing meant to ward off bad spirits and misfortunes. Yet the boy stands alone, crying, looking and waiting, for mom or grandmother I suppose. I wonder how well that string is doing for that little boy’s misfortunes. Down another alley a girl is washing dishes in the street, on the other side I hear screaming and yelling, sounds of slaps and cries. It’s such a long bike ride. It’s loud, harsh, the horns firing off from everywhere. 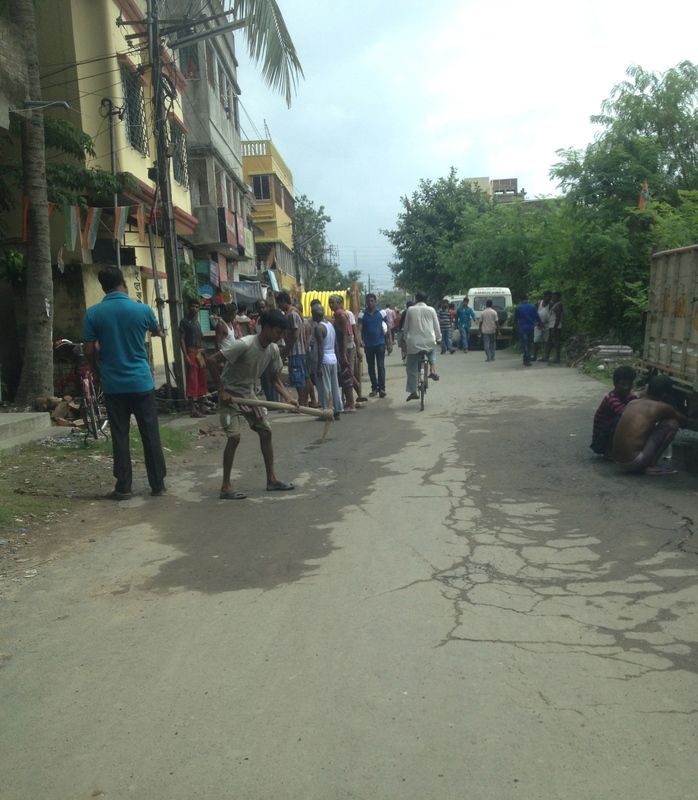 In the middle of the road ahead a man squats near a manhole, holding something. As I come closer I can make out what he is holding, an arm, protruding out form the manhole. The top of his head is just visible, his mouth just above the murky blackish-silver water. It reeks of something awful. I don’t want to think about what’s in that filth let alone be chin deep in it. It’s an unwanted job though, and someone has to unclog the drainage. The nearby artificial pools and lakes are no better and yet they are filled with people bathing in them and others washing their clothes from the water. The river close to the boys home is full of the stagnant drainage as well. The stench is unbearable. I have to pedal faster before I puke. How do these vendors sell any fruits and vegetables right off the bank of this terrible river? It’s not even 9 in the morning and there’s so much to process. So much brokenness and I see it over and over every morning and every afternoon back to my apartment. So much happens in this short ten-minute ride everyday for the past eleven months. I don’t think much will change in the next thirteen. There is a hope, a comfort. Greeted by the sweet hellos and warm hugs from the kids. This is why we are here, why we we get up in the morning and meet each grueling day. To love these kids, to share and show them what the gospel is and to give them a peek into what a true kingdom life can be.